Dar tal-Providenza will keep its annual calendar event on the 1st January by organizing the 23rd edition of the generosity feast. 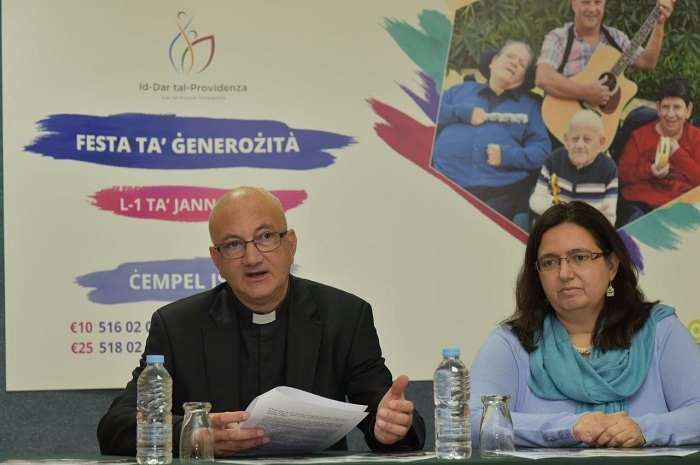 The Home’s director, Fr Martin Micallef, said that the four aims of the feast are that members of the public may meet with residents; watch projects and initiatives being undertaken; the funds raising campaign in aid of the services that Dar tal-Providenza provides; and delivering a message that society should always respect persons with disability, treat them with dignity and offers them choices and opportunities which everyone has a right to enjoy. Addressing journalists, Fr Martin stated that the generosity feast starts at 9am with a Mass celebrated by Archbishop Charles J. Scicluna at the Home’s chapel, while a spectacle of variety and interviews with personalities will be held during the day till midnight. This year the art works auction will be held again at the Parliament building foyer in Valletta on Thursday, 20th December at 7pm. Members of the public may view the works at an exhibition held at Parliament’s foyer and also by accessing website www.dtpauction.com. Visitors to Dar tal-Providenza on the day of activities may avail themselves of a park-and-ride service between 3pm and 9pm from San Niklaw road (the old runway). Those who cannot visit Siġġiewi will be able to follow live transmissions on the major television stations.